I’m reviving a feature from my old blog, at least until I finish my present life as a graduate student in Catholic theological ethics. From time to time, I’ve been sharing a quote from a theologian which I think people might find interesting, challenging, or otherwise important. This particular quote is from a book which I highly recommend, especially in light of the most recent manifestations of what the U.S. Bishops named in 1979 as “an evil which endures in our society and in our Church” (Brothers & Sisters to Us) … racism. The book is called Racial Justice and the Catholic Church (Orbis Books, 2010) by Bryan N. Massingale. Fr. Bryan Massingale is a highly respected Catholic moral theologian who has worked extensively both as an academic and as a practitioner on the issue of racial justice. I was lucky enough to take a very challenging course on the ethics of power and racial justice during my studies at Catholic Theological Union. Massingale’s 2010 book was one of our central texts for the course. It’s easy to read and yet nimbly engages the complex reality of racism, the challenge it poses for the church, and the promise of racial justice. I found his book very challenging and incredibly important. I also found it empowering, especially his work on the need for a theology and practice of lament. Massingale astutely observes that racism engages us viscerally at the gut level. For this reason, we can’t merely rely on reason as we work for racial justice. The emotional responses on all sides to what’s been happening in Ferguson and across the country illustrate this key point. Our shared history and present reality is just too messy to logically “fix” the enduring and embedded reality of racism. Because racism and racial injustice hit us in the gut, they tend to be “impervious” to appeals to reason. If we cannot think, reason, or debate our way through this impasse, what do we do? Massingale believes that we need to “lament the ambiguity and distortions of our history and their tragically deforming effects on ourselves. We need to lament, mourn, and grieve our history. … Lament has the power to challenge the entrenched cultural beliefs that legitimate privilege. It engages a level of human consciousness deeper than logical reason. Lamenting can propel us to new levels of truth seeking and risk taking as we grieve our past history and strive to create an ethical discourse that is more reflective of the universality of our Catholic Faith.” (Bryan Massingale, “The Systemic Erasure,” in Catholic Theological Ethics, Past, Present, and Future: the Trento Conference, ed. James F. Keenan, Orbis Books, 2011). I share his insights because they have been powerful for me, informing both my prayer and my action as a white woman who experiences white privilege every day that distances me from the entrenched reality of racial injustice which my brothers and sisters of color cannot escape. 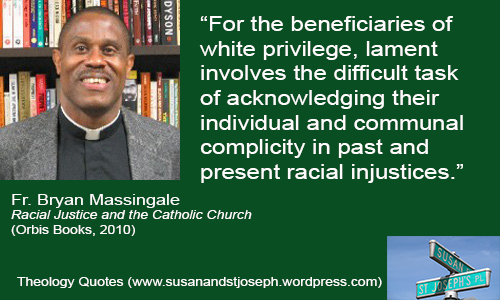 Massingale believes that not only the victims of racial injustice, but even the beneficiaries of privilege, can and should lament. Until we recognize, lament, and mourn this unfortunately reality, we can never effectively counter the distorted denial of our God given equality or find our way to the path towards racial justice. Until we recognize, lament, and mourn this unfortunate reality, we continue to get caught up on rational discussions of bias and prejudice, from which it is easy to distance ourselves, and fail to see the embedded and structural nature of racial injustice from which we cannot escape.